Creating a system to tax and regulate marijuana use by adults over the age of 21 is a sound economic investment for the state of New York. In the states with existing regulated marijuana markets, previously static economies have experienced a boom benefitting a variety of industries that has generated millions in tax revenue and created new jobs. 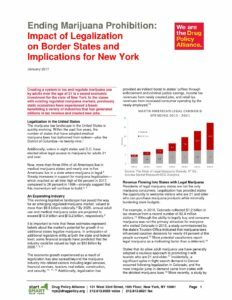 As New York considers legally regulating marijuana for adult use, production, and sale, it is important to consider assessing the status of marijuana access in neighboring jurisdictions. Voters in Massachusetts and Maine elected to end marijuana prohibition in their states in November 2016, and Vermont, New Hampshire, and New Jersey are now better positioned than New York to pioneer marijuana legalization through legislative action. As revenue begins to flow into bordering states, pressure will continue to build for New York to establish its own foothold in the Northeast green rush.